Anthem is a vital planned community north of Phoenix along I-17. This page will feature news related to the Anthem community. The tallest tree in the nation will shine brightly during the 10th Annual Christmas Tree Lighting event at Outlets at Anthem on Saturday, November 19th. 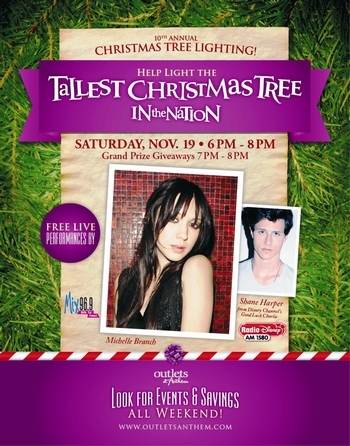 Please save the date and plan to join us from 6pm to 8pm to hear Michelle Branch and Shane Harper perform live. We’re giving away prizes at 7 pm and 8 pm and you’ll find great savings all weekend. Put our 10th Annual Christmas Tree Lighting event at Outlets at Anthem on your calendar and we’ll see you there!